The long, two-column article shown in the pictured news clippings is from The Bryan Eagle newspaper published Wednesday, March 23, 1938. This petition was the second official step toward the incorporation of the City of College Station. A few weeks ago, I presented the history of the March 4, 1938 letter, which was authored and delivered by several citizens to the Texas A&M Board of Directors, asking if they would object to incorporation procedures. I will give more information on the results of this petition in a few months on the anniversary of its presentation to the Brazos County Judge and Commissioners. This March 22 meeting was apparently newsworthy around Texas. The smaller clippings pictured are from the March 24 and March 25 editions of various state newspapers including Mexia News, Corpus Christi Times and Sweetwater Reporter. These and other clippings were found here in a section titled “Publicity Vol. 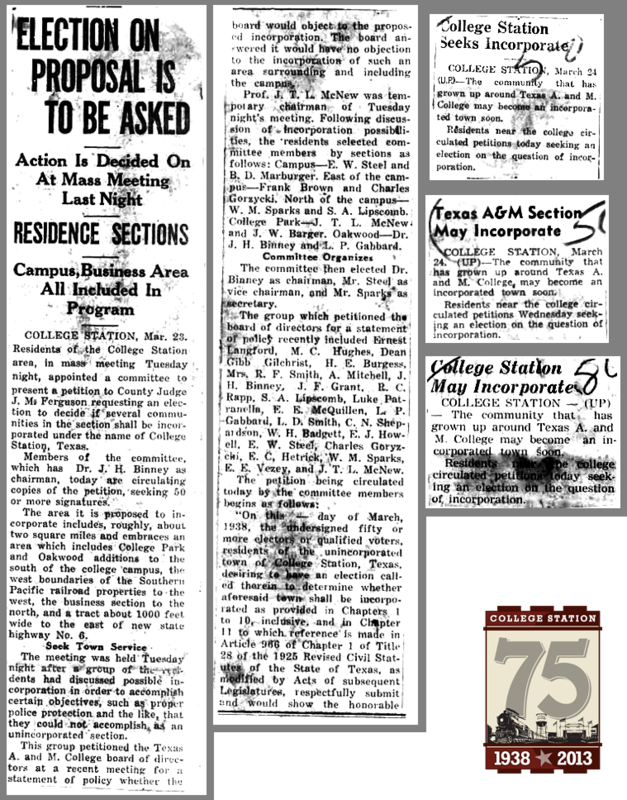 01 March 1938-December 1950” of the City of College Station’s historic online library database, otherwise known as Project HOLD. In fact, these news items are the very first ones in volume one of the publicity notebooks. This entry was posted on March 27, 2013 by City of College Station. It was filed under Historic Preservation, Public Communications and was tagged with 75th anniversary, history, news.